There are many ways to enjoy France. It is a country of such diversity, indeed, of such size, that it can take many years to discover your favourite places, and more than a lifetime to discover everything! You can travel from Britain by boat, by car, by train, by aeroplane (French Connections) and then when you arrive you have even more choices ahead (Travel France). There are many who enjoy walking, and France offers infinite possibilities for them (Finding property in the best walking areas of France). Horse riders too, are spoiled for choice (Horses in France), with some of Europe's most spectacular scenery opened up by an excellent network of bridleways. Car drivers find the excellent auto routes get them from one end of the country to the other in no time at all compared with the packed and gridlocked roads of the UK, but, perhaps, the most popular and delightful way of travelling around in France has to be on two wheels. Cycling or motorcycling in France? The choice is yours. France is highly amenable to both types of vehicle, and adopts a positively benign and friendly attitude to riders of either. Of course, a lot depends on whether or not you have the energy and fitness to cycle distances and to tackle the undulating territory that is such an essential part of France, or whether you need to cover great distances at speed, in which case you will probably choose the motor powered option. France is, traditionally, a cycling friendly country. You only need to think of the passion that the French display for the annual Tour de France, where the entire country not only welcomes the cyclists and their entourages, but gets decidedly febrile over it! Roads are closed all over the country for cycling competitions and time trials, and you can barely travel down a French country road on any Sunday without seeing at least one group of luminous Lycra clad cyclists. Many of them, on close inspection, appear to be a minimum age of around 96, but does this deter them? Not a jot. In fact, it can be hard to overtake them even in a car, as they whiz up the most impossibly steep inclines with apparent ease. Almost every town in France has a cycling club, and youngsters are encouraged to take up the sport from a very early age (Sport in France). The weather, of course is more conducive to a good take up rate for cycling than that of England (Weather in France), where would be cyclists can be understandably put off by the prospect of spending so many hours battling against the wind and the rain to which so much of Britain is subject! There are also cycling shops in every town, and usually cycle hire shops too. Many people still use the bicycle as an everyday means of transport, and on any market day in any town you will see the classic "Shopper" out in all its glory, proudly wearing its traditional basket on the front, stuffed with goodies fresh from the market stalls. If it is wobbling slightly on the way home from market, give it a wide berth... its pilot has possibly been indulging in a little market stall wine tasting! The French, in general, display respect for cyclists, and are far more cyclist aware than is often the case in the UK. "Think twice, think bike" seems to be built into a French driver's psyche in a way that doesn't exist elsewhere, and cyclists and motorcyclists are usually treated with courtesy on the roads. In the UK, it is not uncommon to find cafés and bars and even shops where the sign on the door reads "No Bikers Allowed". I could be proved wrong on this one, but it is a sign I have yet to see in France. Motorcycling seems to enjoy a better reputation altogether here, and a preference for two wheels rather than four is not instantly associated with a predisposition to violence and drugs! France is happy to celebrate the joys of motorcycling, and the country also supports motorcycle sport at its highest level, with some of the most important and exciting world championships held at its race circuits. The famed circuit of Le Mans hosts the world endurance races, which take place over a full 24 hours, and there is also the French motorcycle Grand Prix held at Magny Cours. 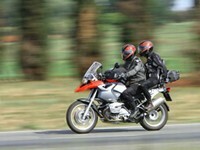 Does France have the best roads in Europe for motorcycling? Many motorcyclists claim that France has some of the best motorcycling roads in Europe, and having experienced a few of them I would tend to agree. Sweeping bends, twists and turns winding up into the hills and mountains and offering views that many can only dream of, French roads are an invitation to discover the delights of motorcycling. When you are on a motorcycle you are somehow much more aware of the countryside you are passing through, and the chill of the rushing air and the scents of the lavender and the pine trees (and... yes even of the farms!) awaken the senses and create one of life's most exhilarating experiences. The following comments are from Paul and Debbie Tyler, who are both school teachers living in Co. Durham, in England. They are, however, supremely well qualified to talk about travelling around France on two wheels and their cycling and motorcycling experiences, detailed below, are both an endorsement of these modes of transport in France as well as full of helpful advice for those who would follow in their footsteps. "We cycle about 10,000 miles each year, 1,500 of these are in France, which are bliss compared with the cycling we do in Britain. France is paradise for cycling. The French motorists are far more used to seeing cyclists on the roads and so are much more respectful, considerate and safe than are their British counterparts. We never bother to book ahead as we cycle for as long as we feel like on any given day. We can do this because France has so many beautiful towns and villages with welcoming bars, "menu de jour"' restaurants, cheap hotels, chambre d'hôtes and picturesque campsites. This summer we stayed in little hotels that had good rooms for three people for less than €30 all in. The French have had a long love-affair with "le velo"'. Every time we have had any bother with mechanical problems or accommodation we have been treated most helpfully and generously. When we've expressed surprise the answer has always been (in French), "But of course, you are cyclists!" French trains are brilliant for cyclists. You are advised to book ahead for you and the cycle, although the cycles go free. On the super fast TGV's you'll need to take the wheels off your bike and put the whole machine in a bike bag. The ubiquitous French shop Decathlon sells cheap bike bags that do the job. Last summer we had a fun day getting ourselves and our bikes from Le Havre to Carcassonne via the slow train to Paris, a friendly taxi and the TGV. We left our bike bags at the Youth Hostel and picked them up three weeks later. No charge of course…"You are cyclists!". France has every type of cycling. If you want a relaxing time, then wander along the banks of the River Loire (The Central Loire Valley Property Guide, Pays de la Loire Property Guide), any where down stream of Nantes (Nantes Property Guide). If you want more of a challenge, try cycling the High Pyrénées from the Med to the Atlantic (South-west France Property)! I have also travelled much of France by motorbike. Every hotel, hotel etape, chambre d' hôte and campsite has welcomed motorbikes and bikers. The French police seem particularly fond of my 1970's BMW's and have nodded and waved as I've sped passed them at well over the speed limit. Just be careful on the (less interesting) auto routes where average speeds are calculated between pay stations and where hidden speed cameras abound. Oh yes, and make sure the bloke who ties down the bike on the ferry doesn't rip a bloody great hole in your new seat." Despite the tolerance experienced by Paul with regard to speed limits and motorcycles, it should be noted that this is not always the case. France has actually a zero tolerance speed limit policy, so although French gendarmes may well have an empathy with motorcyclists you are advised not to chance your luck! That said, don't be put off. Cycling and motorcycling in France are both really great experiences, and represent wonderful new ways to discover more of this beautiful country and to meet its fascinating and friendly people. Four wheels may not be bad, but two wheels are most certainly good! Bon voyage! I am a U.S. citizen and resident. I would like to purchase and then resell a bike in France (probably from and to a dealer in Paris, tentatively) after about a month's stay, and was wondering if there are companies that will either issue short-term insurance or will issue a refund of the premium upon cancellation of the policy and/or resale of he bike? They speak excellent English and explain things clearly at all times and are very helpful. They are happy to operate at a distance, everything can be done through email, telephone and post.